At Northwest College, we try to give a little more every day to our students. It’s that little extra that makes us such a great college. It adds up every week, every month, every year. Here’s a video showing what it means after decades—showcasing some of our recent retirees who’ve become legends on campus. Today on #GivingTuesday, I invite everyone to join us in giving just a little bit more. It’s easy. Go to www.nwcollegefoundation.org or text “NWC” to 501501 to give $10. No matter the amount, every gift counts. 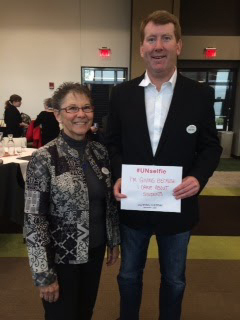 Meet two special people who’ve already joined the NWC Foundation’s #GivingTuesday and proudly posed for an "unselfie." They are Nada Larsen of Meeteetse, Board of Trustees Vice President/Secretary, and Shawn Warner of Powell, NWC Alumni Association President. Thanks for all you do, Nada and Shawn!